Can You Wear PJs All Day? The pajama top trend is off and running. Of course we are LOVING this. Anything that makes pajamas fashionable and chic is right up our alley. On a recent plane ride back from the Caribbean, I was loaded up with 4 spring fashion mags and discovered that each presented a “How to Wear Pajamas” article about taking this Spring 2012 trend from the Louis Vuitton runway to reality. 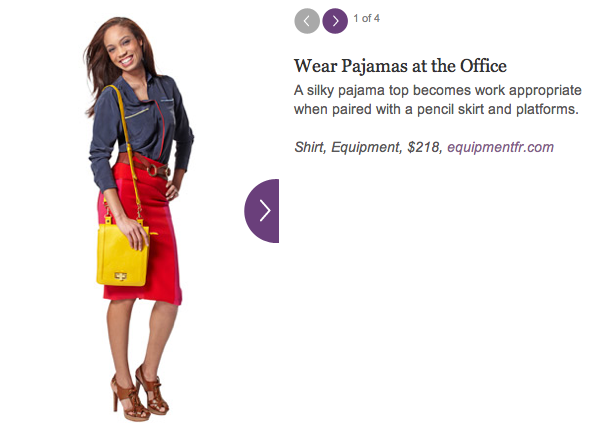 O Magazine did a great job of showing a practical slideshow with cool outfit options. Check it out here.